While there will always be fans of both Android and iOS ecosystems, not to mention brand loyalty among many smartphone users around the world, there are many who prefer a more objective view of scrutinising their next purchase. 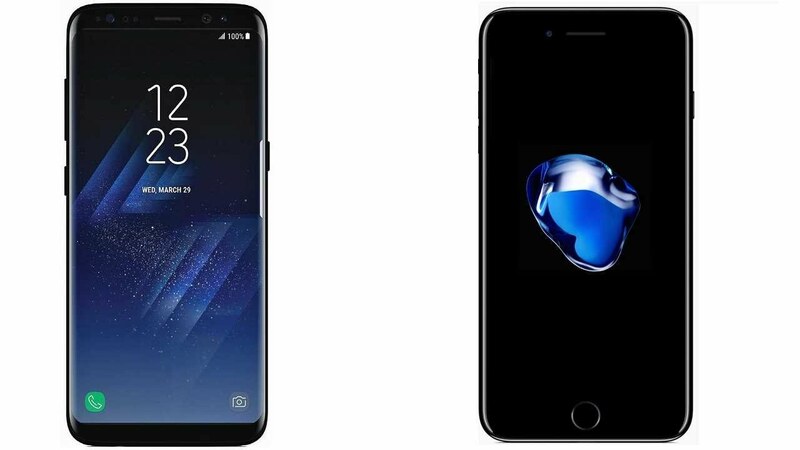 There will always be a few reasons that one cannot quantify by empirical or scientific means, but we’ll stick to the latter in the analysis breakdown between the Samsung Galaxy S8 and the Apple iPhone 7. A fresh look or a familiar feeling? This may be the least objective of all the reasons, since beauty is in the eye of the beholder. However, there’s a lot to take from the S8. For example, Samsung has dramatically overhauled the look of the latest Galaxy flagship, removing the home button, and adding the Infinity Display. In addition to this, Samsung has also squeezed all the additional hardware and features into a design that’s only a millimetre thicker than the iPhone 7. There is, however, one obvious distinction between the two, and that’s the pronounced camera bump on the rear of the iPhone 7. We all can admit that it’s a bit of an eyesore, much as it was on the Galaxy units for so many years. As the argument goes, users shouldn’t notice much of a difference in pixel density in a 5″ device higher than 720p. I would suspect that those tests may have been performed in the years when 1080p resolutions were only making their way into the market. That said, the Infinity Display is a pretty spectacular jump between the S7 and S8, even more so when you consider the edge-to-edge, curved design. As far as resolution, pixel density, colours and brightness are concerned, the S8 is hands down the best choice when compared to the iPhone 7. This issue has been raised time and time again, with many of the iPhone fans having voiced their frustrations leading up to the release of the iPhone 7 in 2016. While the Bluetooth headsets are a lot more technologically advanced, the technology isn’t as wide-spread as Apple would like, with many users still preferring the 3.5mm headphone support, especially if they had made a significant purchase of headphones or earphones before the launch. The S8 offers a range of unlocking features compared to the iPhone 7. While they may not all be flawless (tests have shown the Iris Scanner can be hacked with a simple image), the options are still there for your ease of use. The S8 offers the standard Pin, password or pattern unlock options, along with a few biometric features such as facial recognition, fingerprint scanner, and the iris scanner. I love the ease of being able to pick up my device in one hand and having the device unlock without too much input from my side. Running the dual option of iris scanner and fingerprint reader means that whichever is faster to perform, it will unlock using that option. Often times, I’m able to lift the phone towards my face and it unlocks before I make an attempt to do so. The iPhone 7 has a metal chassis, which may offer more in terms of strength of the device, but does mean that Apple has not given much, if any, thought to offer their users wireless charging capabilities. The S8 offers both fast charging and wireless charging options, in addition to the fast wireless charging, options not available on the iPhone. We won’t go into battery size on this one. Apple may be working on a few products, and if the news and rumours are to believed, more so along the lines of Augmented Reality, or AR. Samsung has been offering users a form of VR for over a year now, and the latest Gear VR additions have only strengthened their grip on the smartphone VR market. Google has offered quite a number of initiatives to bring affordable VR to the masses, but the addition of the haptic controllers alongside the VR makes it a pretty good proposition. 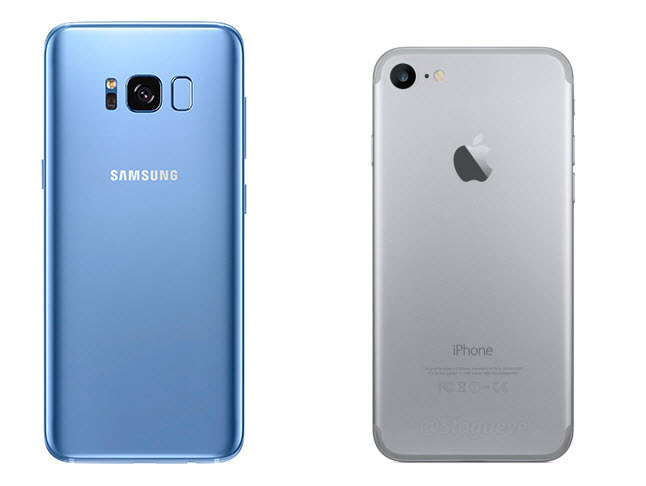 When it was announced that Samsung has fitted a similar 12MP camera to the rear as with the S7, there were many who were disappointed with the announcement. That said, the company has tweaked the camera a little, while enhancing their software capabilities quite dramatically to offer quite impressive photography. Over the years, Samsung has held a small advantage of the iPhone as having the better camera, but there’s quite a big gap being created right now, thanks to its HDR performance, macro shots, bokeh, much more detailed shots, and many other features. The camera app itself also adds a whole list of features to be used as your take your photos throughout the day. One would have suspected that choosing to launch without the 3.5mm jack would have given the iPhone 7 an advantage on the IP rating of the device, but the S8 still comes out on top here. With its IP68 certification over the IP67 rating of the iPhone 7, the S8 is waterproof at depths of 1.5m for 30 minutes. Yes, this is still a thing. There may be certain advantages of choosing internal memory of 128GB versus a removable microSD card of the same capacity, and vice versa, but the fact remains that many users still want this option. Additionally, while you are able to buy an iPhone 7 with capacities of up to 256GB internal storage, the added price – we’re talking a few thousand Rands here – for that storage compared to regular microSD cards is simply not worth it. Last but not least we have the DeX support, which offers the user an option to use their S8 smartphone as a desktop. While it may still be early days, the results look promising. In addition, there is a huge potential to grow the smartphone gaming market to further enhance this capability, so be sure to watch this space. 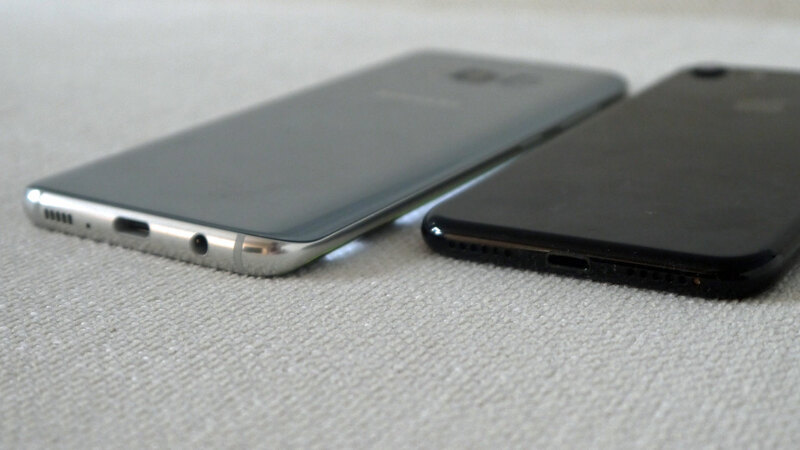 Technically, I gave 10 reasons why the Samsung Galaxy S8 is better than the Apple iPhone 7 and easily one of the best phones on the market to date, but it sounded better having 8 reasons for the S8. 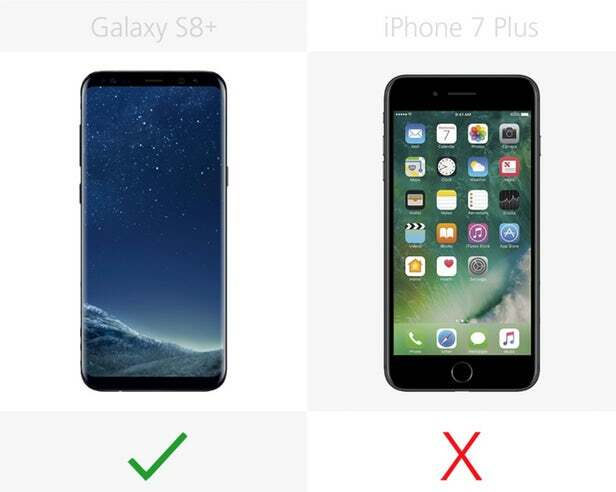 While there are a few reasons why the iPhone 7 may be a better phone than the S8, but I think it’s pretty safe to say that the above-mentioned are pretty high on the list of user requirements when it comes to choosing their next smartphone. As much as I agree with alot of the points raised above, its hard to give a proper comparison between the 2 devices as they’ve been launched 7 months apart. Technology changes at the drop of the dime and Samsung had time to better what the iPhone 7 has to offer. But I love my idevice, I can’t cut and paste most times, commenting on many sites is nearly impossible for some reason, the wifi turns off magically, what is not to like? It’s like no one at Apple uses an Apple product. They never get the problems sorted out. Too long between minor updates…. I love it.